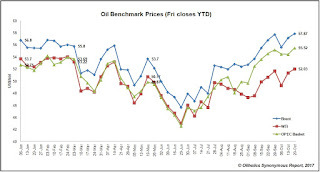 Oilholics Synonymous Report: Rig count falls and crude oil bulls rise! Rig count falls and crude oil bulls rise! Another Baker Hughes weekly rig count gives the oil bulls crumbs of comfort. Perish the thought, if you are thinking the Oilholic is understating the recent price rises. The current climate does offer the bulls a position of relative strength compared to how the quarter before was panning out. The latest count shows the biggest one-week rig drop in US Permian Basin in 19 months, with the headline count down by 15 to 913 operational oil and gas rigs stateside. More so, because the Russian and Saudi heads of state do seem to be contemplating an extension of the OPEC and non-OPEC production cut agreement ahead of the 30 November meeting of oil ministers in Vienna. Add all of it up and you’ll find the mildly bullish sentiment is not misplaced. In fact, the probability of the ‘on-paper’ cut of 1.8 million barrels per day (bpd), of which OPEC’s share is 1.3 million bpd, being rolled over beyond March is pretty high. The Oilholic would say 80%. Of course, these are bizarre times in the crude market, as the recent appeal by OPEC Secretary General Mohammed Barkindo to US shale players to also cut production suggests. Right now, signatories to the OPEC / non-OPEC agreement appear to have little choice but to roll over the cuts as there is a clear absence of an exit strategy. However, the cap has to end someday, and that’ll be a field day for the bears (at some point in 2018) with Saudi Arabia, US and Russia all tipped to have production levels above 10 million bpd next year. That presents little prospect of the so-called ‘elevated’ oil price to escape its current range, as yours truly noted in a recent Forbes post. Have a read, alternative viewpoints are most welcome – just ping an email across. For the moment, it’s about playing the longs week-on-week in the run up to the OPEC meeting based on the newsflow. However, 12 months out, the oil price would struggle to stay above $65 per barrel using the West Texas as a benchmark, as more non-OPEC oil is bound to come on to the market the moment it caps the $60-mark. That's all for the moment folks! Keep reading, keep it crude! © Gaurav Sharma 2017. 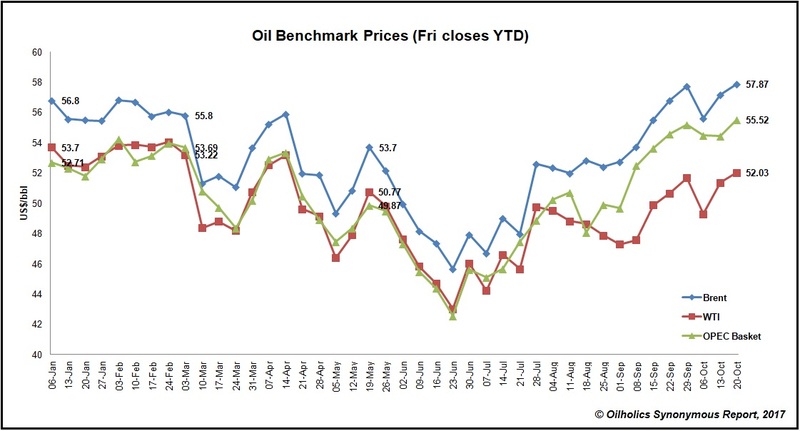 Graph: Oil benchmarks closing prices on Friday from January 2017 to date © Gaurav Sharma 2017.